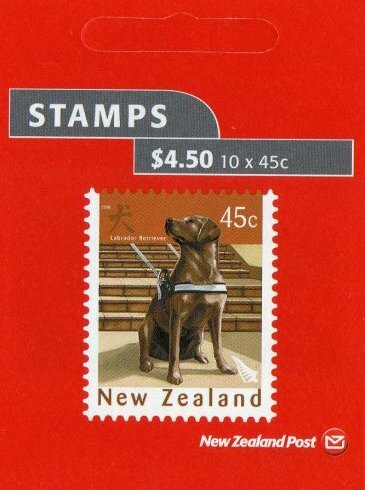 10 self adhesive stamps of 45c Year Of The Dog. 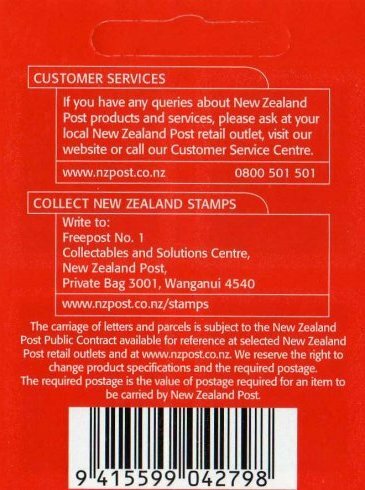 Red foldable cover incorporating a hanging slot. 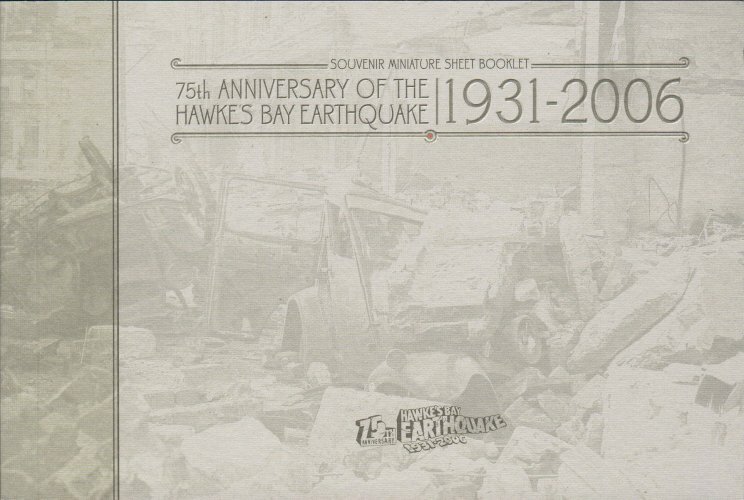 The booklet contains two of each value, in the set of 20 Hawkes Bay Earthquake, in seven miniature sheets. 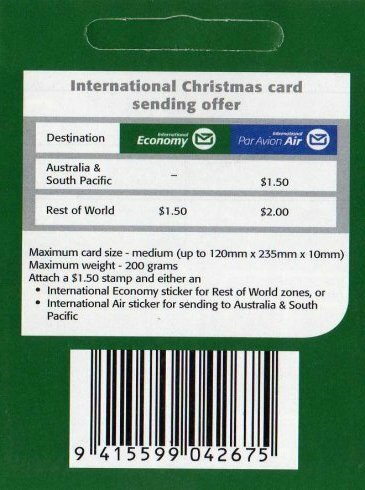 10 self adhesive stamps of $1.50 Christmas. Green foldable cover incorporating a hanging slot. 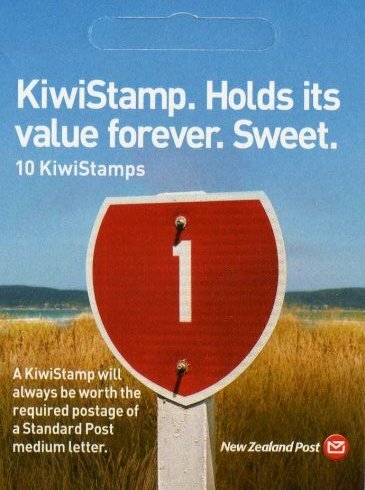 It contains 1 free stamp. 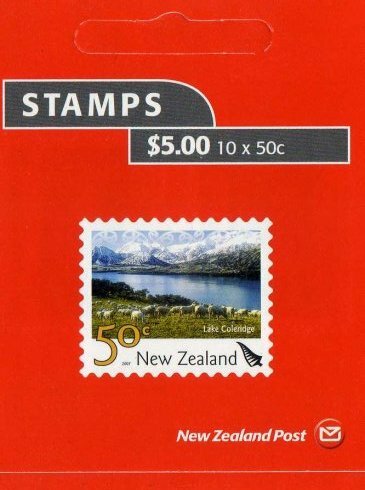 10 self adhesive stamps of 50c Lake Coleridge. 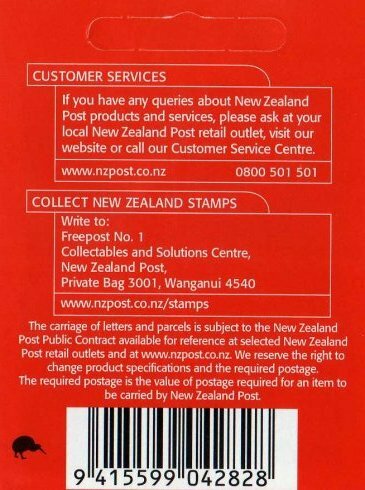 Red foldable cover incorporating a hanging slot. 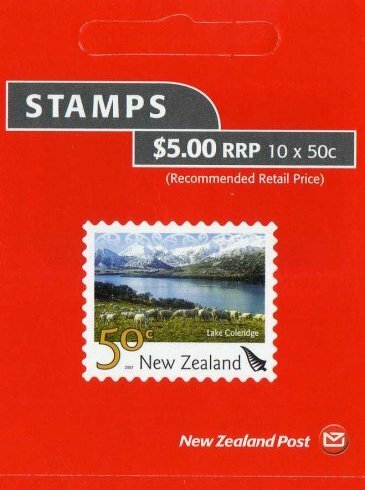 10 self adhesive stamps of 50c Lake Coleridge. 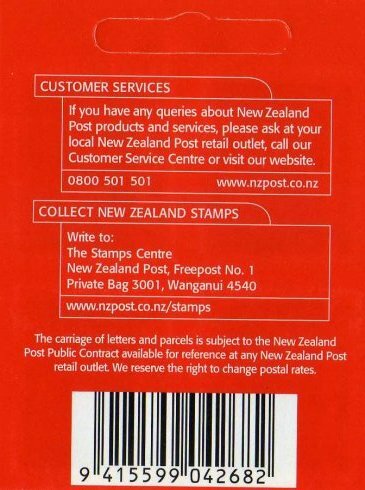 Red foldable cover incorporating a hanging slot. 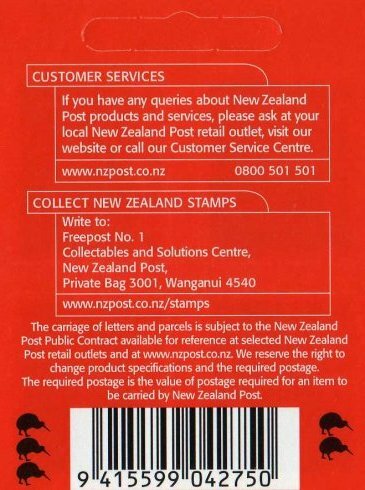 1 Kiwi, with 2008 new postage rates table. 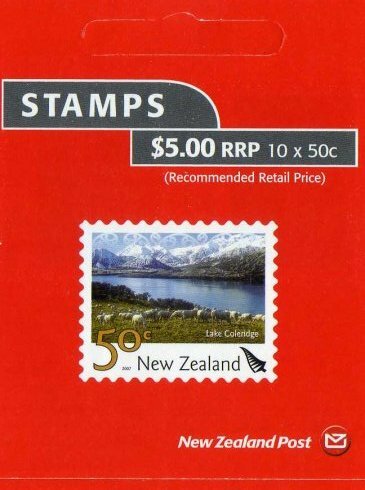 10 self adhesive stamps of 50c Lake Coleridge. 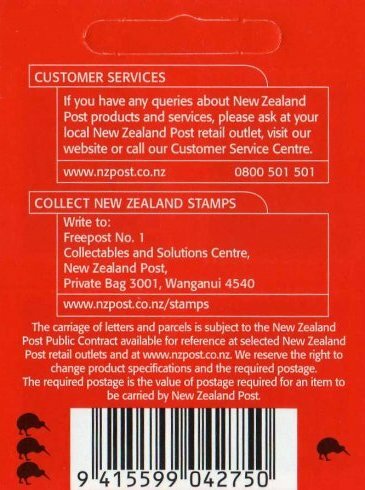 Red foldable cover incorporating a hanging slot. 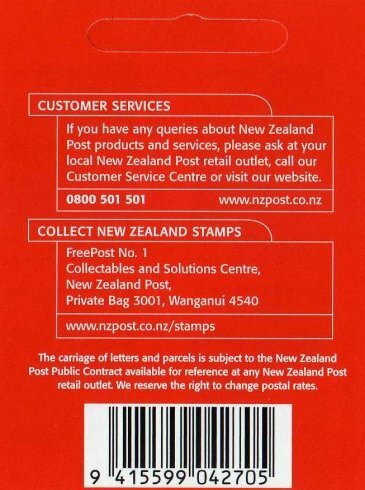 2 Kiwi, with 2008 new postage rates table. 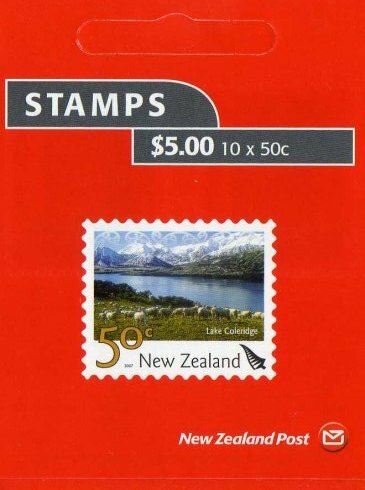 10 self adhesive stamps of 50c Lake Coleridge. 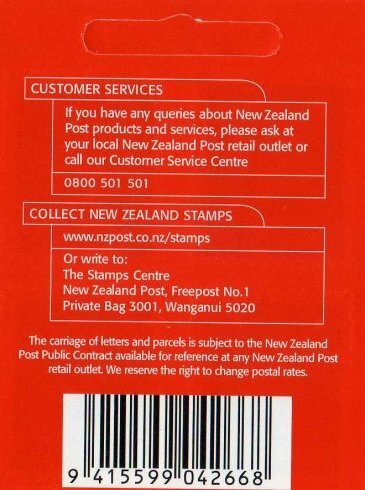 Red foldable cover flap incorporating a hanging slot. 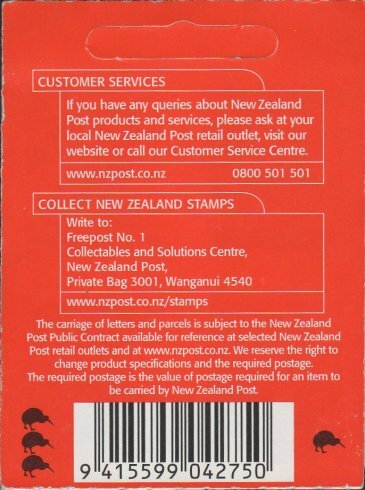 3 Kiwi, with 2008 new postage rates table. 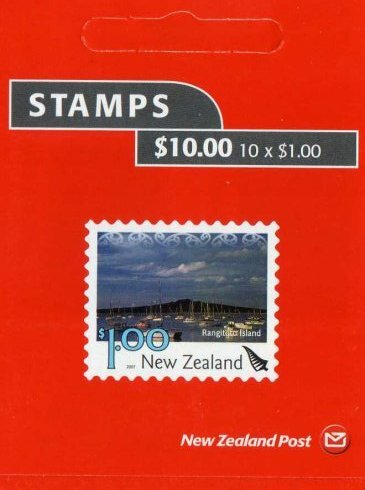 10 self adhesive stamps of $1.00 Rangitoto Island. Red foldable cover incorporating a hanging slot. 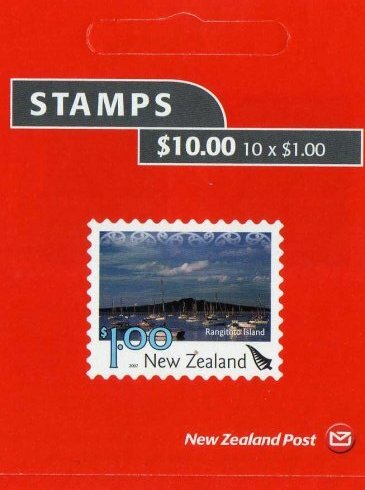 10 self adhesive stamps of $1.00 Rangitoto Island. Red foldable cover incorporating a hanging slot. 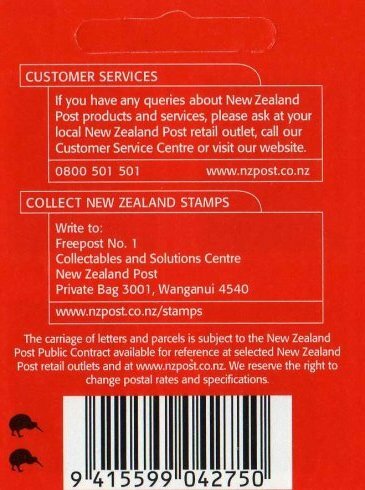 1 Kiwi. 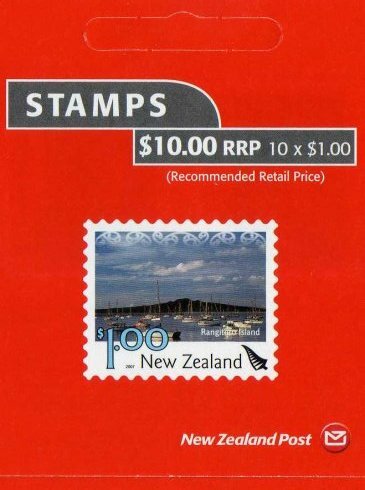 10 self adhesive stamps of $1.00 Rangitoto Island. Red foldable cover incorporating a hanging slot. 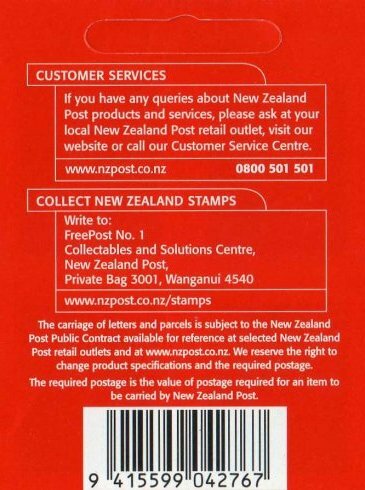 2 Kiwi, with 2008 new postage rates table. 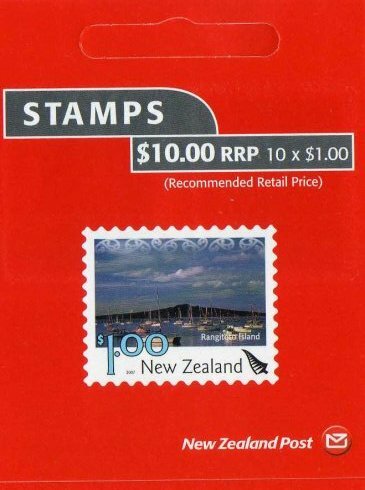 10 self adhesive stamps of $1.00 Rangitoto Island. 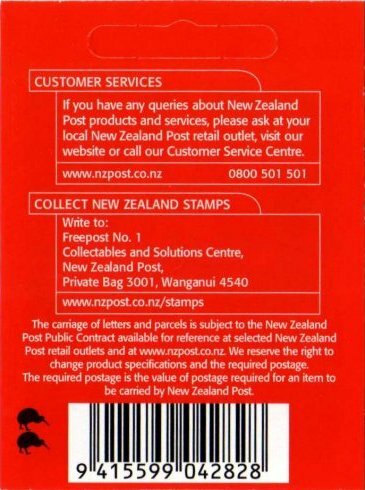 Red foldable cover incorporating a hanging slot. 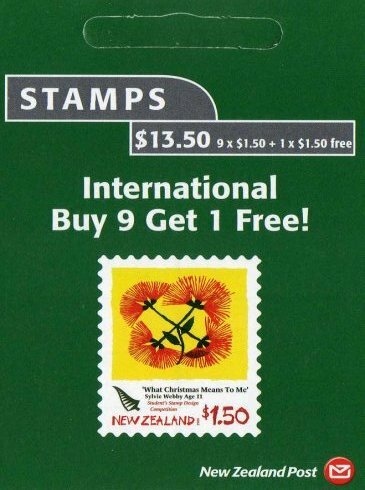 3 Kiwi. 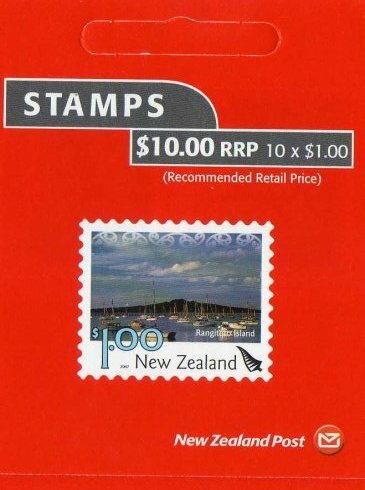 10 self adhesive stamps of $1.00 Rangitoto Island. 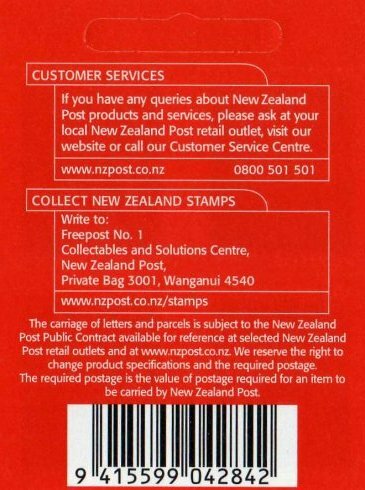 Red foldable cover incorporating a hanging slot. 4 Kiwi. 10 self adhesive stamps of $1.00 Rangitoto Island. 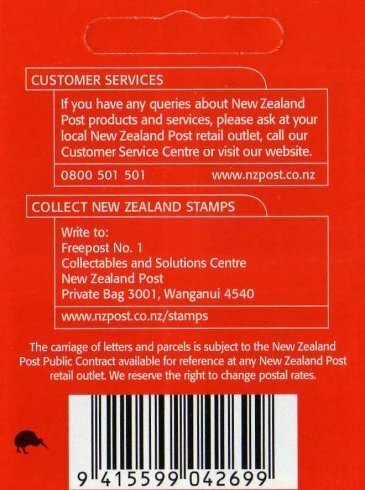 Red foldable cover incorporating a hanging slot. 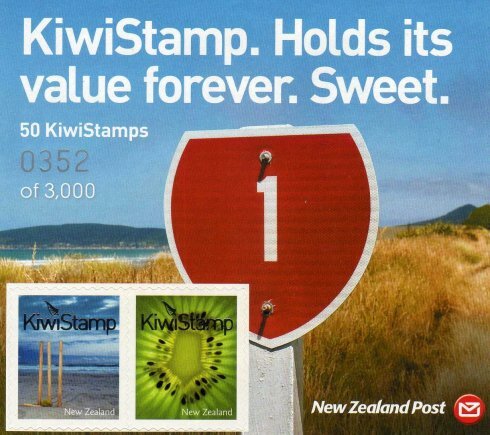 4 Kiwi. 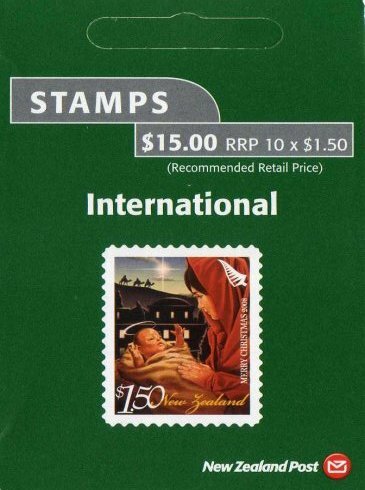 All Stamps Completely Imperforate. 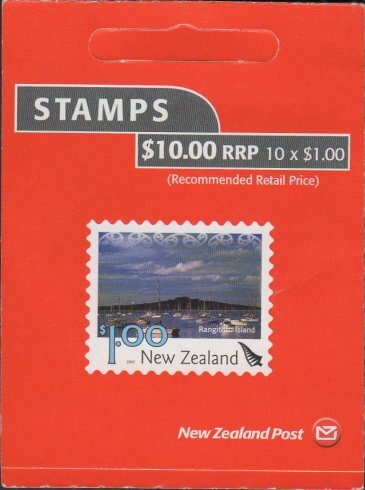 10 self adhesive stamps of $1.00 Rangitoto Island. 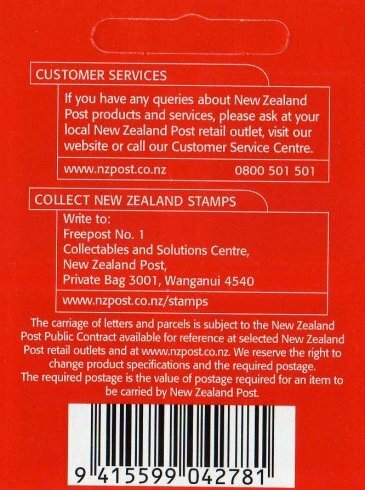 Red foldable cover incorporating a hanging slot. 5 Kiwi. 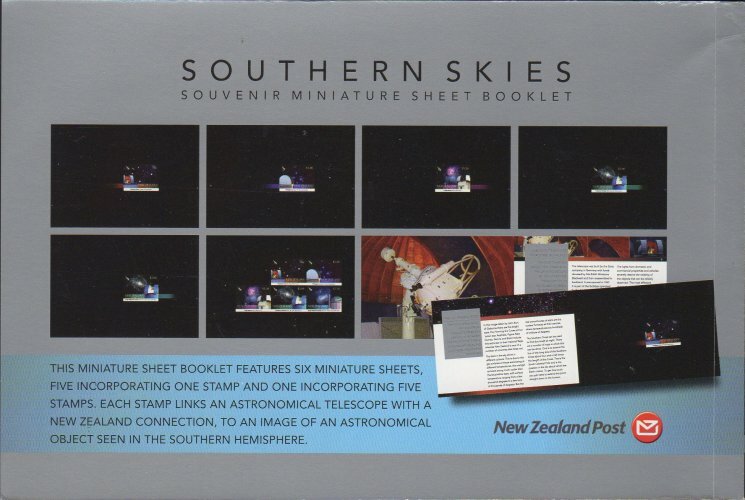 The booklet contains one of each value, in the set of 5 Southern Skies, in miniature sheet form and a sixth miniature sheet containing all 5 values. 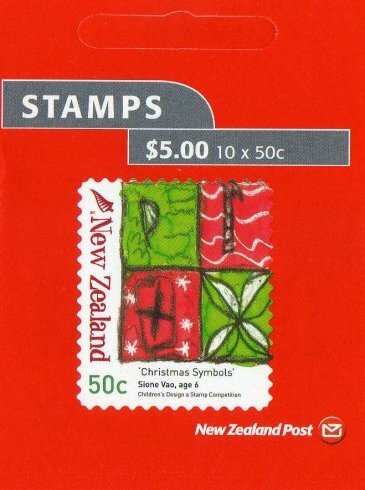 10 self adhesive stamps of 50c Christmas. Red foldable cover incorporating a hanging slot. 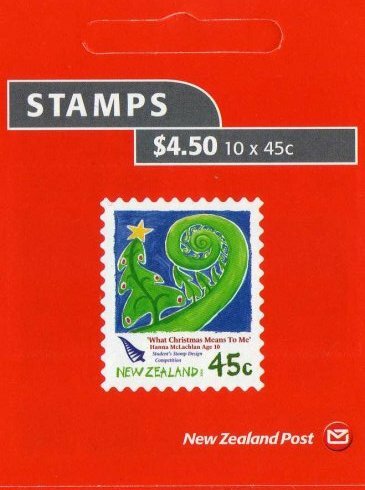 10 self adhesive stamps of $1.50 Christmas. Green foldable cover incorporating a hanging slot. 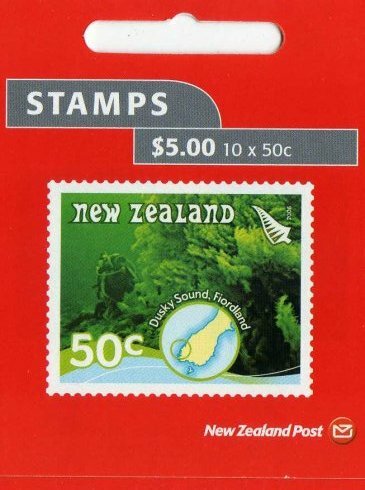 10 self adhesive stamps of 50c Dusky Sound. Red foldable cover incorporating a hanging slot. 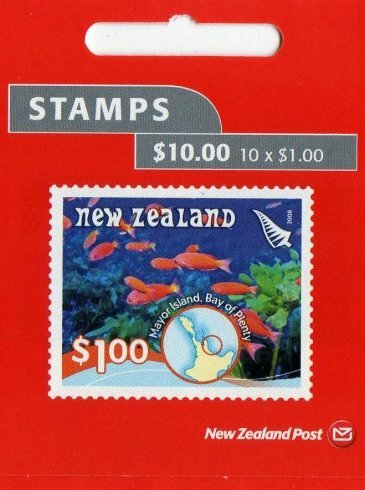 10 self adhesive stamps of $1.00 Mayor Island. Red foldable cover incorporating a hanging slot. 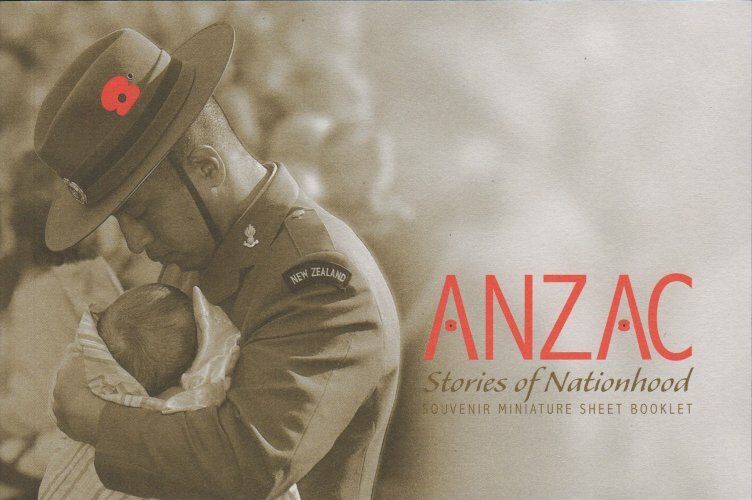 The booklet contains one of each value, in the set of 6 Anzac, in miniature sheet form and a seventh miniature sheet containing all 6 values. 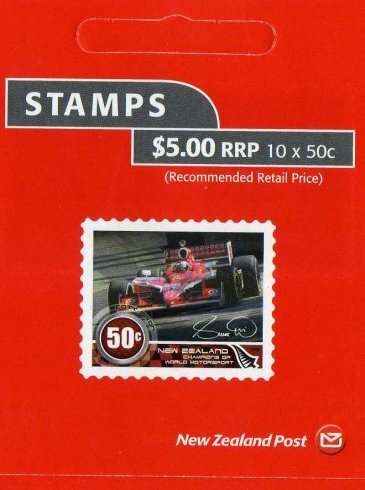 10 self adhesive stamps of 50c Scott Dixon. 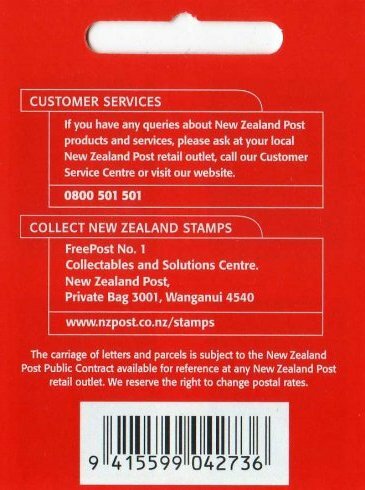 Red foldable cover incorporating a hanging slot. 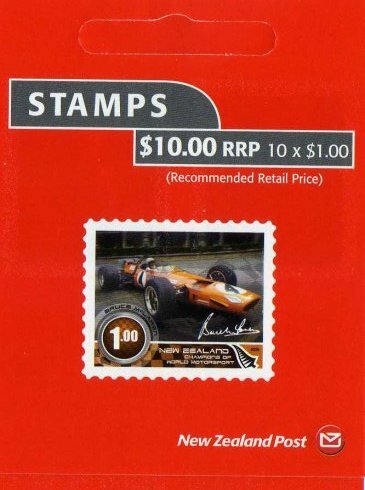 10 self adhesive stamps of $1.00 Bruce McLaren. Red foldable cover incorporating a hanging slot. 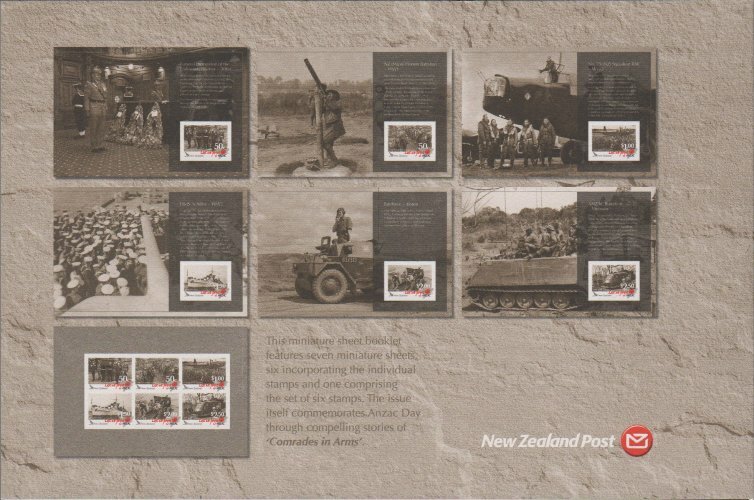 The booklet contains one of each value, in the set of 6 Anzac II, in miniature sheet form and a seventh miniature sheet containing all 6 values. 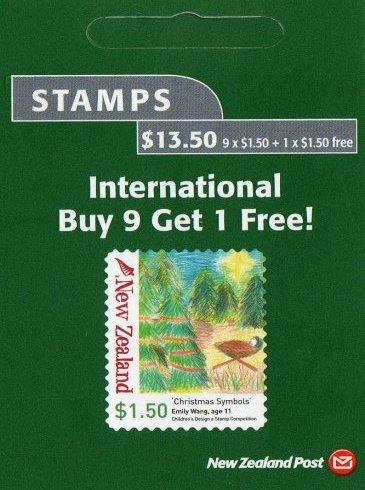 5 self adhesive stamps of $1.80 Russell. 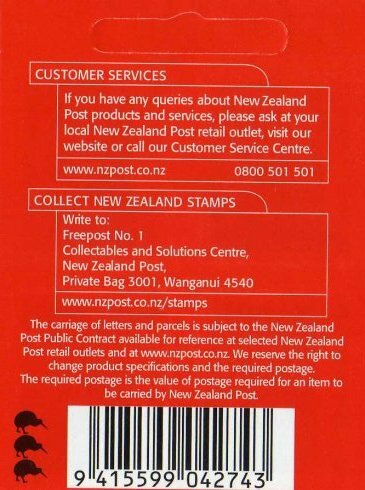 Red foldable sheet of three folds incorporating a hanging slot. 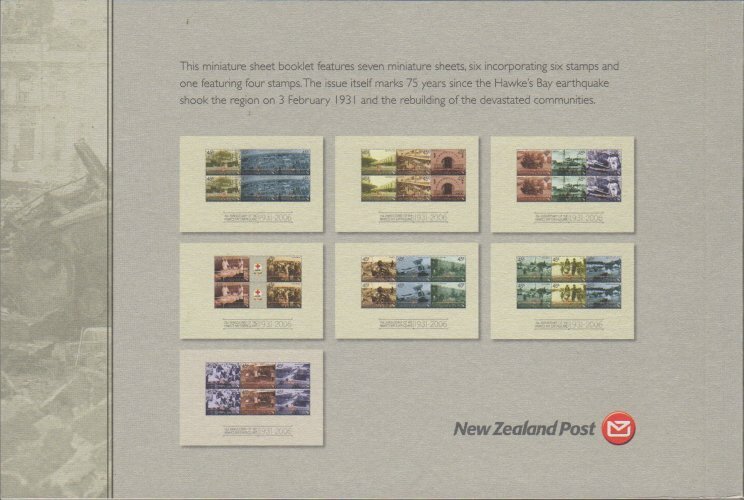 5 self adhesive stamps of $1.80 Russell. 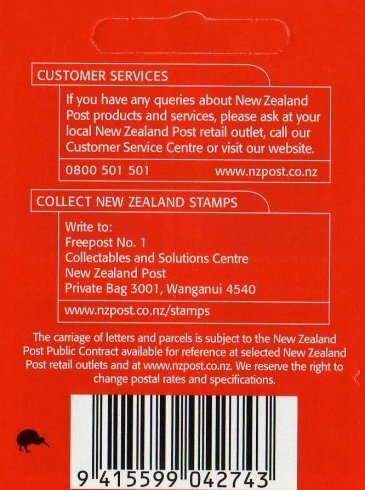 Red foldable sheet of three folds incorporating a hanging slot. 1 Kiwi. 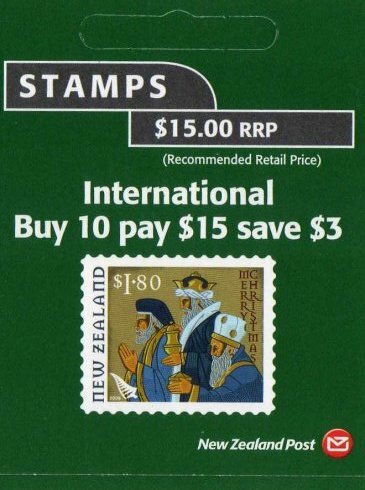 5 self adhesive stamps of $1.80 Russell. 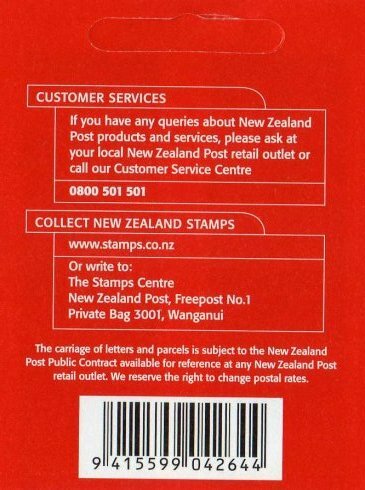 Red foldable sheet of three folds incorporating a hanging slot. 2 Kiwi. 10 self adhesive stamps for Domestic Standard Postal Rate. 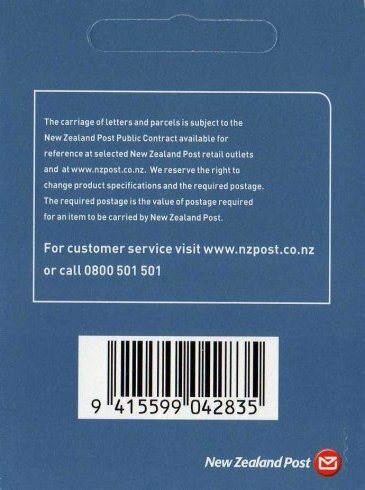 Blue foldable sheet of three folds incorporating a hanging slot. 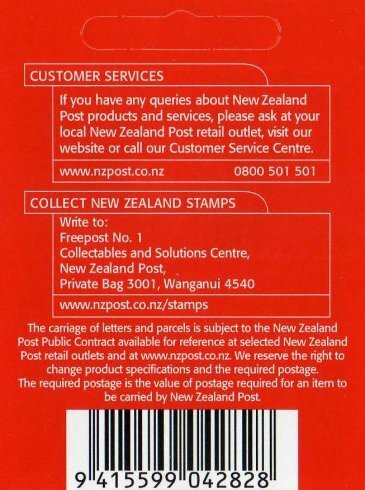 10 self adhesive stamps for Domestic Standard Postal Rate. 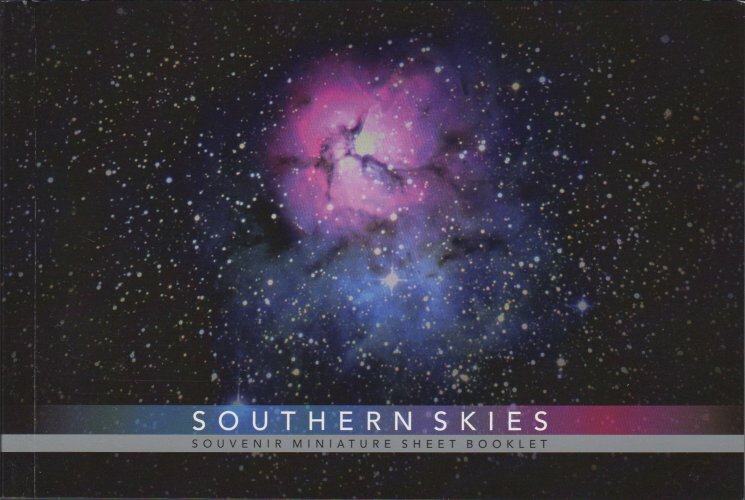 Blue foldable sheet of three folds incorporating a hanging slot. 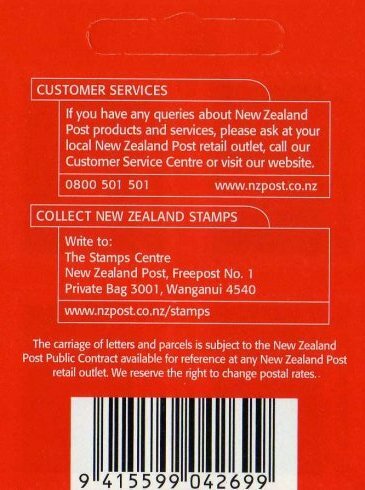 This is a special printing of 11,000 booklets with the word "KiwiStamp"
and the silver fern printed in silver foil on each stamp. 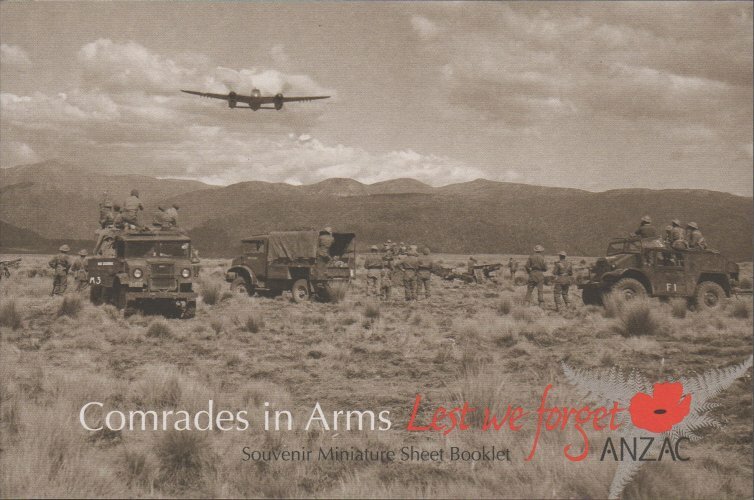 Each booklet also has a unique number printed at the top of the first inside fold. 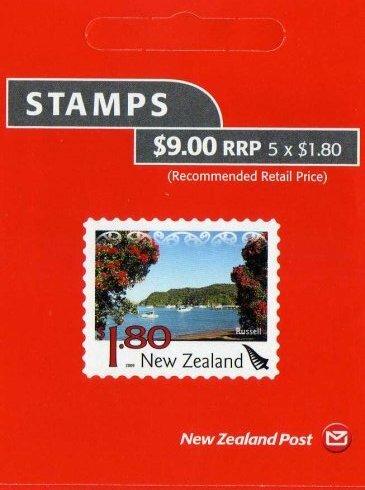 W122zzz 2009 No Value Booklet (KiwiStamps) Self Adhesive ?? 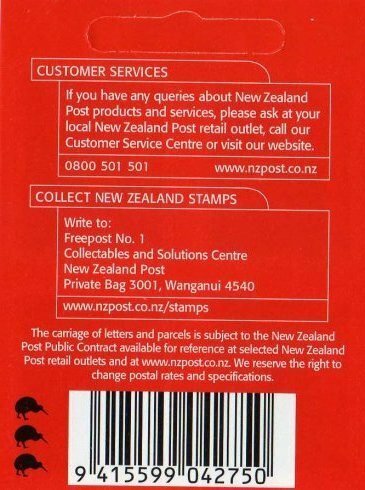 50 self adhesive stamps for Domestic Standard Postal Rate. Blue foldable sheet of five folds. 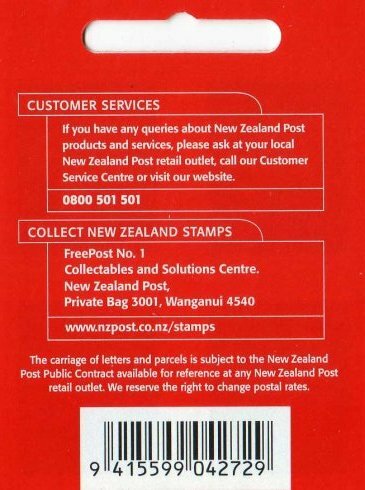 This is a special printing of 3,000 booklets with the word "KiwiStamp" and the silver fern printed in silver foil on each stamp. 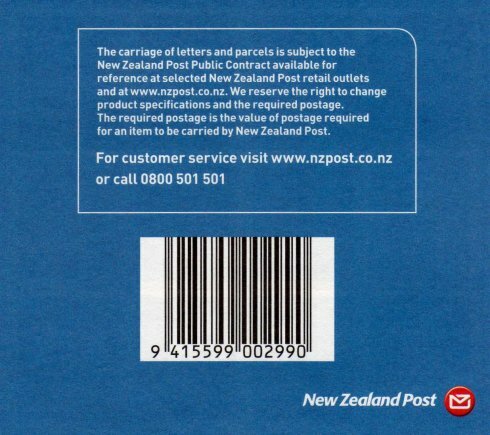 Each booklet also has a unique number printed on the front cover. 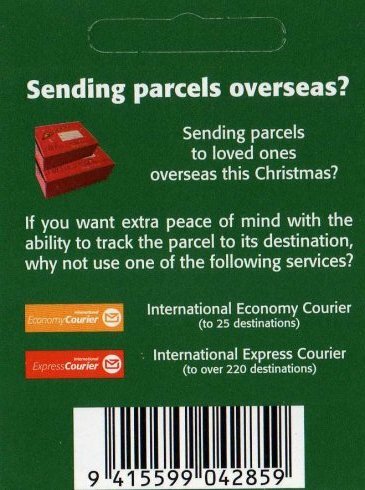 Part of inside shown. 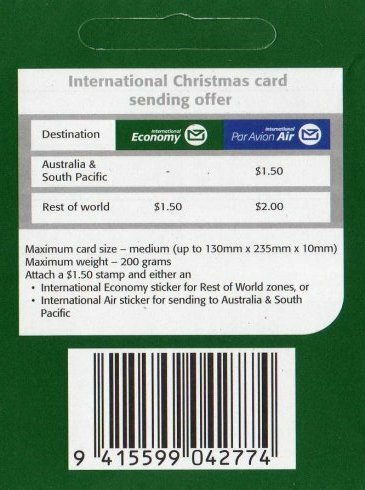 There are four panels of 12, and 2 stamps on the cover. 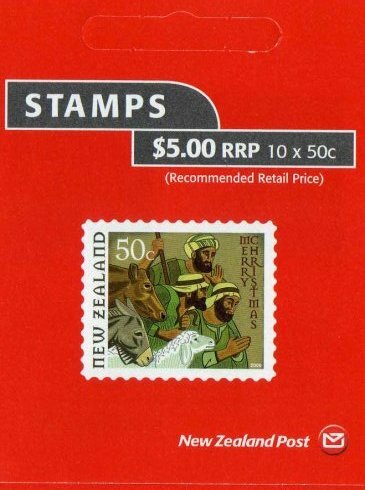 10 self adhesive stamps of $0.50 Shepherds. 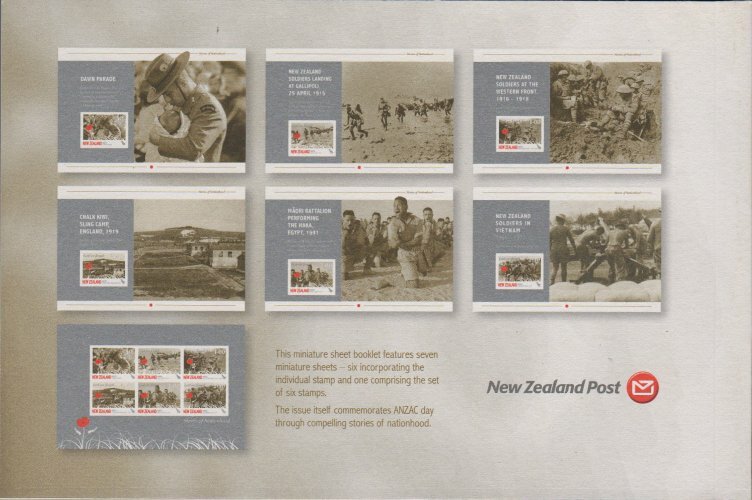 Red foldable sheet of three folds incorporating a hanging slot. 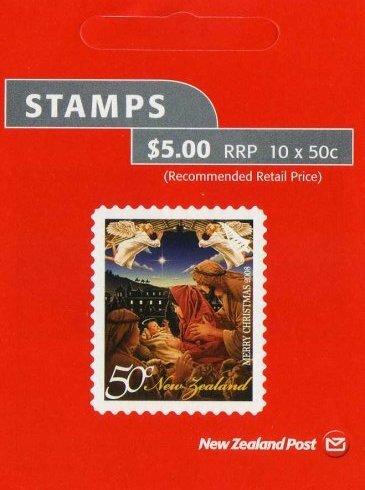 10 self adhesive stamps of $1.80 Magi. 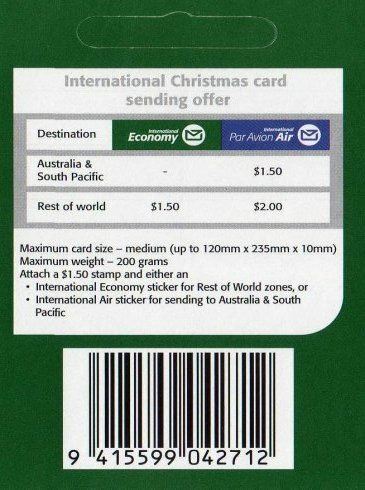 Green foldable sheet of three folds incorporating a hanging slot.